Today we decided to work in town on finding things that we need for the classroom, getting food from the market, and taking care of a few more details of life. 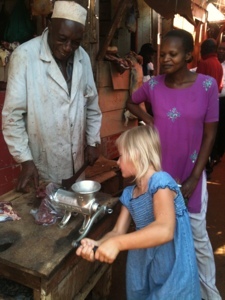 Below is a photo of Esther grinding the beef in the market to make mince (ground beef). You pick the portion of the carcas you want, they cut it off with a machete and chop into pieces that they put into the grinder. Normally they charge 1,000 shillings (about 40 cents) for grinding and they do it for you, but the butcher thought Esther would like the job. She enjoyed it, but we still paid them for the use of the grinder. I also learned that to receive a package, you walk around the back of the post office into an area that seems like a back alley/loading dock and you find Moses. You pay him the customs fees (they weren't too bad), sign in two different ledgers and then you can take your packages. I am thankful that a summer intern at GSF showed me how to do this, because I never would have figured it out on my own. I was just picking up packages for other missionaries and for kids in the sponsorship program, but we now can receive mail too. Claudia Arrango, another missionary on our team, has generously offered to share her box with us since it was going to take much time and money to get our own. So we can now receive letters and packages at PO Box 1960, Jinja, Uganda, East Africa. Overall today has been fairly productive although our desire to get some high speed Internet (which would be slow to normal speed in the US) in order to work on banking and other necessary paperwork has not yet happened. David has gone back out to try again. We did do our shopping for the rest of the week, met with the man who will build more desks and chairs for our classroom, found someone else who makes bookshelves, and found a restaurant with good chips (French fries) for lunch. It has been a good day and we are eating spaghetti for dinner tonight so the children should be happy. It feels like we are settling in a bit, for which I am thankful!